World-first bank data research from Commonwealth Bank and the Melbourne Institute is set to transform our understanding of financial wellbeing. 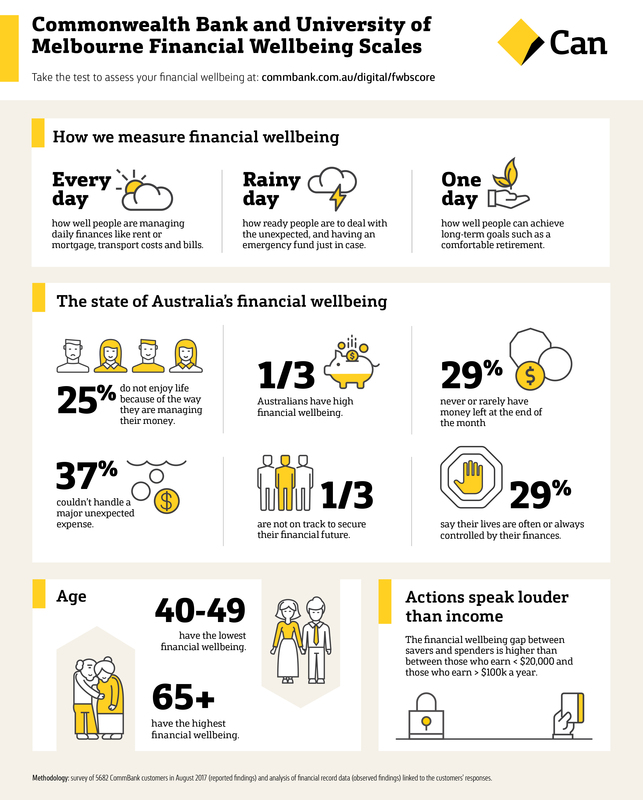 Matt Comyn, Commonwealth Bank CEO: "Our purpose at Commonwealth Bank is to improve the financial wellbeing of our customers and communities ... a vital step to achieving our pupose is also defining and measuring financial wellbeing so that we can work to improve it in meaningful ways." Professor David Ribar, Melbourne Institute: Applied Economic and Social Research at the University of Melbourne: "As excited as we were to create the scales, we are even more excited by this second stage in the collaboration in which we use the scales to investigate Australians’ financial wellbeing and to examine the characteristics that are associated with high and low financial wellbeing. The insights from these analyses add to our understanding of financial wellbeing." There's data, research and collaboration behind the science. Whether you are saving, spending or thinking about the future, it's all contributing to your FWB. The Scales provide dimensions of understanding that represent a first in its field, internationally. Get a better understanding of your financial wellbeing so you can take steps to improve it, whether that means taking control of your finances, handling an unexpected expense or reaching your future goals. The Financial Wellbeing survey was developed in partnership with the Melbourne Institute: Applied Economic and Social Research at the University of Melbourne.